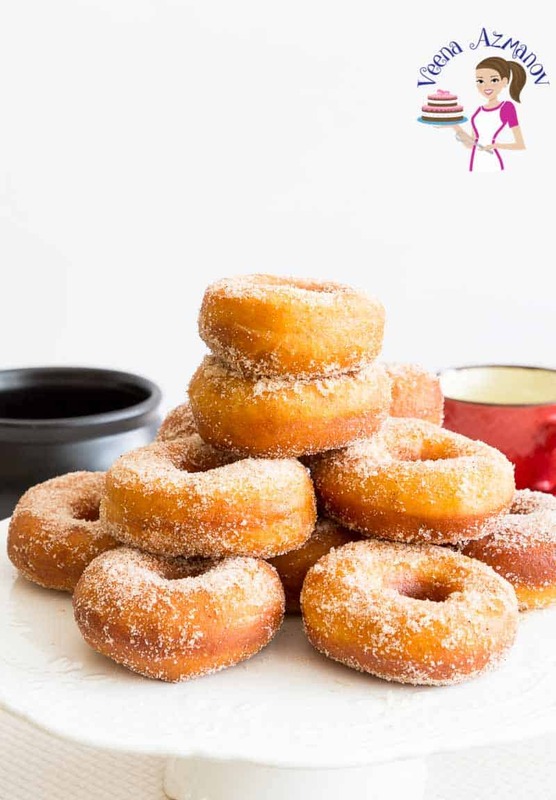 These homemade fried cinnamon sugar donuts are the ultimate old fashion sugar treats. Go back to your childhood pleasure of dunking you face in sugar. Light and fluffy, soft and sweet on the inside. And deep fried until golden then dusted liberally with a delicious mixture of cinnamon and sugar. Perfect any time of the year for kids and grown-ups. 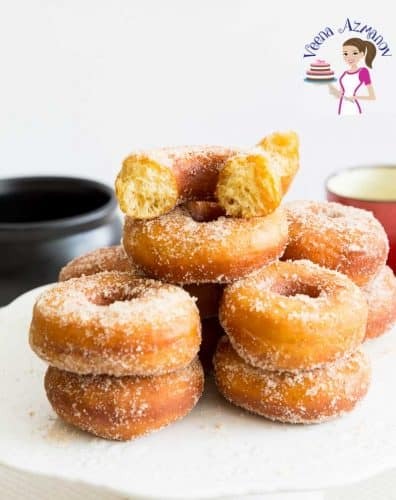 Remember those childhood days when mom made cinnamon sugar donuts, and there was sugar everywhere, on your face, your hand and in your hair. Well, every time I make cinnamon sugar doughnuts for my kids I miss my mom even more. Unlike me, she never complained about all the mess we kids made. She’d graciously clean after us and live in the joyful moment of her kids were having fun. Today when I look back in time I find my self appreciating her calm and patience. These are the absolute classic donuts, fried not baked. So there is no holding back on this one. Therefore, if you eat it, make sure you enjoy it guilt-free to the last grain of sugar. Made with a sweet yeast-based dough, proved twice before being dunked in hot oil and puff until golden brown. And as soon as they come out of the oil, they are liberally coated in a mixture of cinnamon and sugar. The recipe makes only 12, but you can double the batch without any issues. 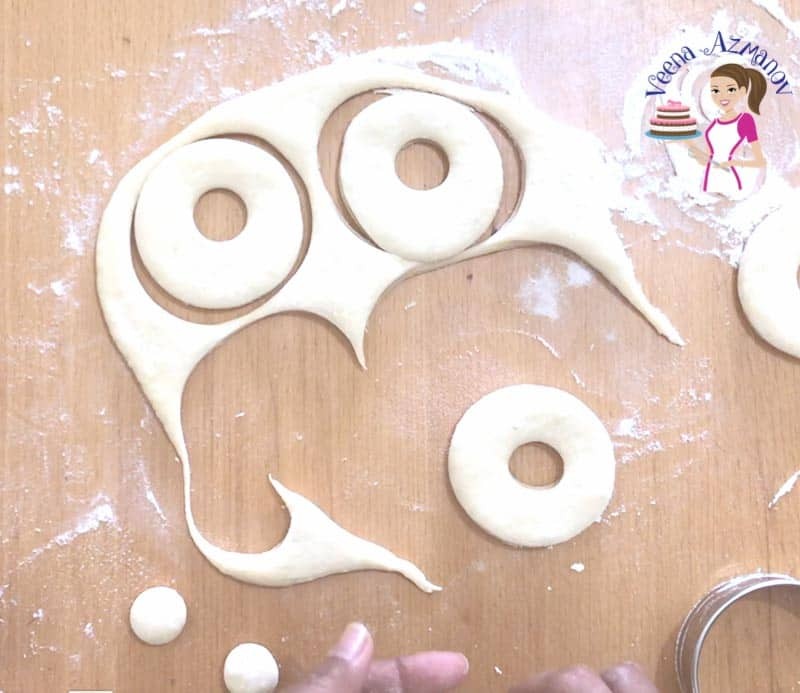 I have two secrets to share with you today regarding my donuts making technique. 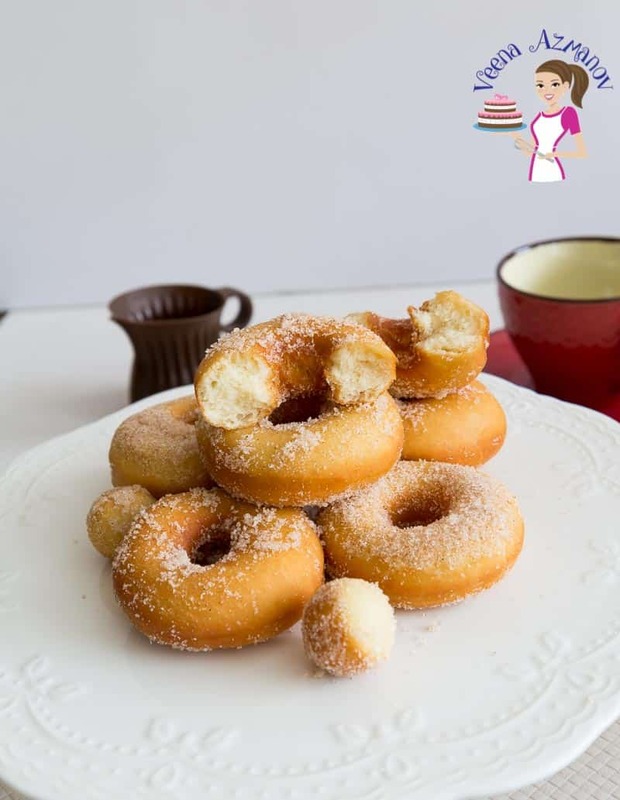 Often people hate making fried donuts, and that’s because they are not easy to handle. I agree. Well, here’s my secret. Are you ready? Keep the dough soft, elastic and slightly sticky. 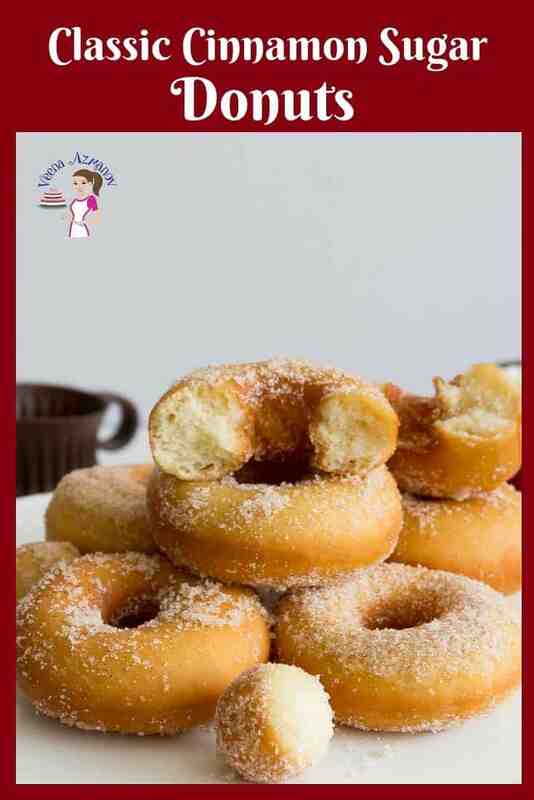 The softness in the mixture (not extra butter) will produce a melt in your donuts when fried. I admit that soft dough is more difficult to handle. So that’s why I have a second tip for you. Chill the donuts before you fry them. Trust me on this little trick. Chilling the dough makes it more stable. That butter, eggs, sugar, and flour all get a chance to relax. As a result, you can pick the dough, and it won’t fall apart even though it is puffed up. How many types are donuts are there? Well, There are these fried donuts with the hole in the middle, often glazed or dusted with some confection. 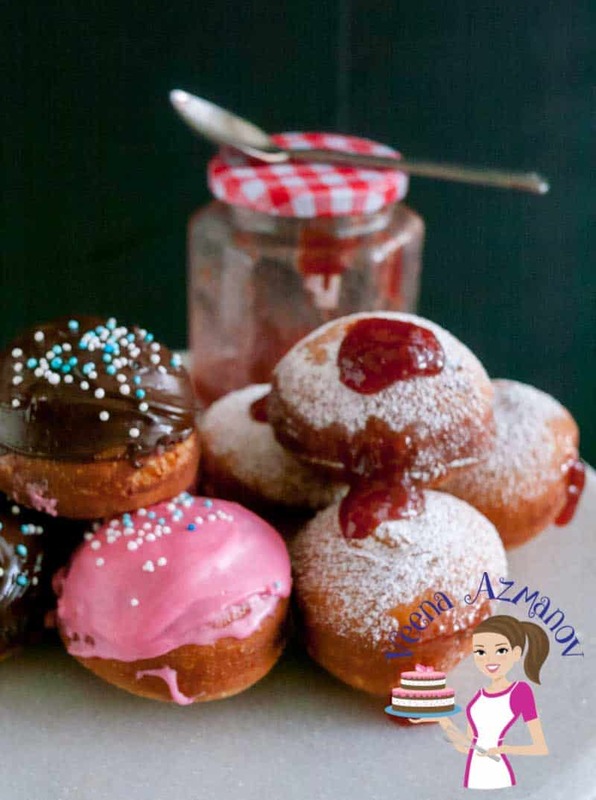 Then, we have the filled doughnuts like the jam doughnuts often called Sufganiyot. Of course, let’s not forget there are also cake-based baked donuts. Why are donuts fried? What do you fry them in? You can make bake donuts, which are cake batter-based like I have done here in my baked pumpkin donuts. And yet, traditional doughnuts are fried and have a yeast-raised dough. 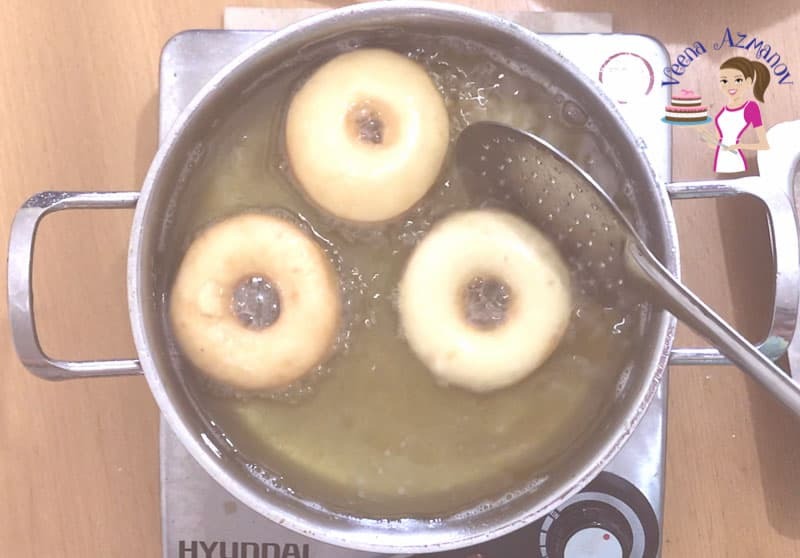 What oil is best of frying donuts? I use canola oil. It has a neutral flavor and a high smoke point. Also, it works best when deep frying bread and sweet treats like churros and doughnuts. Can I refrigerate the donut dough and make them tomorrow? Yes, just let the dough rise in the fridge. It will continue to prove but at a slower pace. Remove it an hour or two before you plan to roll the doughnuts, so it comes to room temperature. And then, roll them and continue with the recipe as usual. 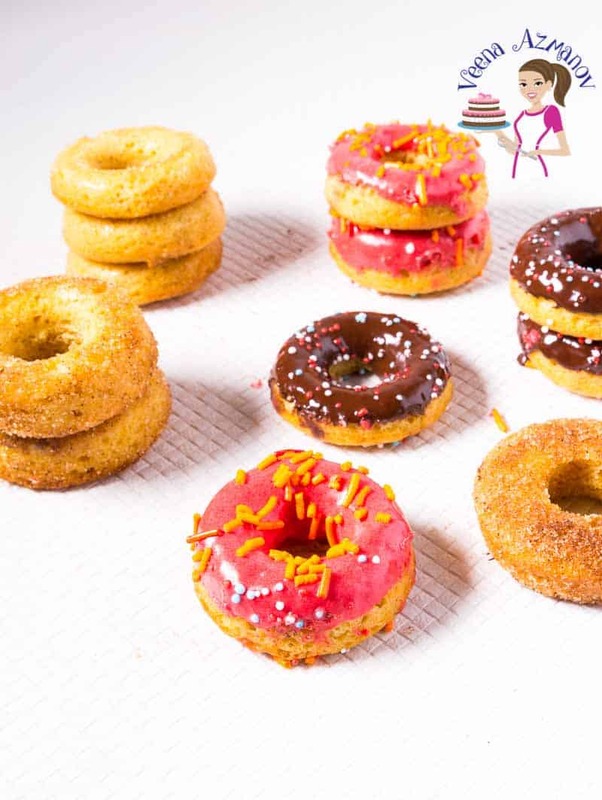 Here are a few more donut recipes that I’ve already shared with you before. Don’t forget to check out my tips for the perfect donuts every single time. Yeast – I like to use instant dry yeast because I’ve always had great success with it. And yet, you can certainly use active dry yeast in the same quantity. If you use fresh yeast, you will need about 21 grams for every 2 1/4 tsp (one envelope) of dry yeast. Also, it’s not necessary to activate the yeast, but I like to take the guesswork out and make sure my dough will rise. 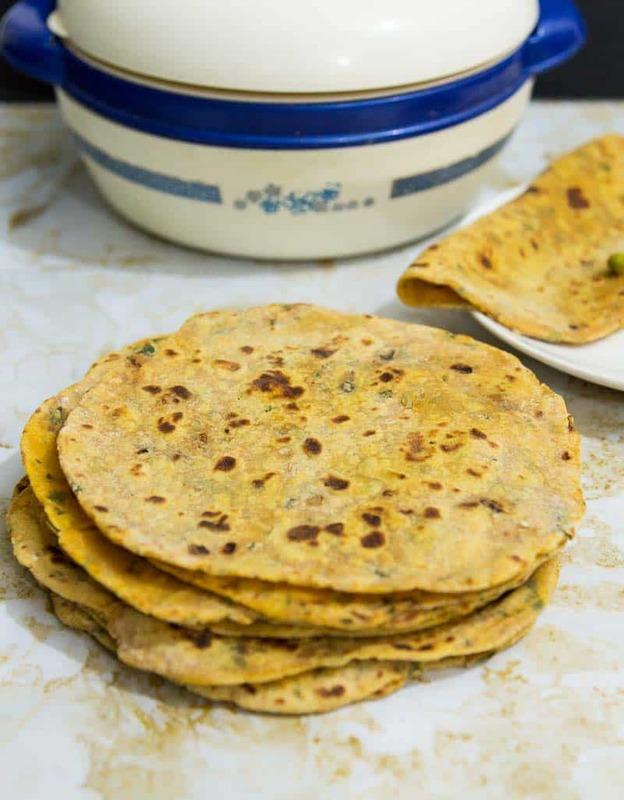 Butter – This adds richness to the dough. Do not add more butter as they will become very dark when frying. 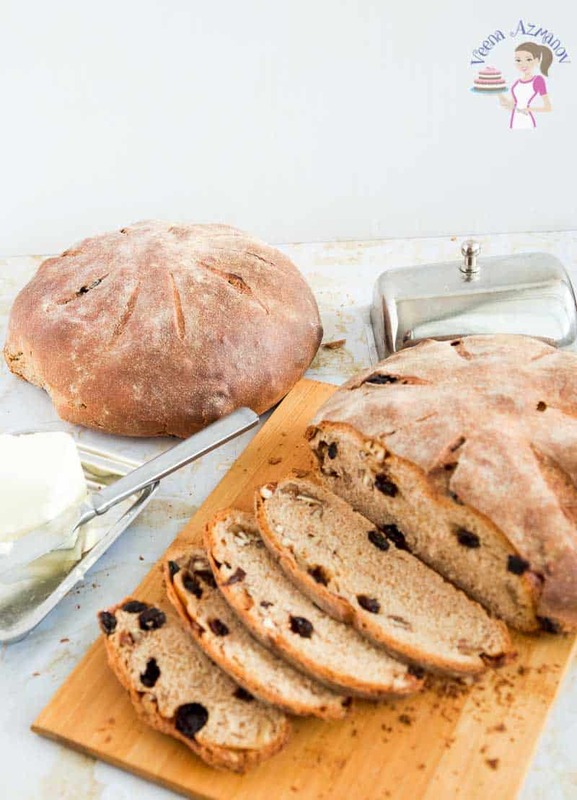 Milk – I love adding a bit of richness to the dough and milk works great in this recipe. Water will also work well. And if you do use water, you may need a little more flour in this recipe. Sugar – White sugar works excellent in this recipe. And yet, you can undoubtedly try brown or any other sugar. I think the amount here is just enough for both the inside and out but feel free to add or reduce if you want. Flour – I always use all-purpose flour for most of my yeast recipes. Because it’s the most readily available. And yet, you can use bread flour as well for a softer texture. Nutmeg – There is nutmeg in the pumpkin spice, and yet I love that extra dash of nutmeg as it brings out that flavor of fall beautifully in these donuts. Feel free to reduce or omit. Cinnamon – A mesmerizing spice any time of the year. Use as little or as much as you like. While cinnamon is the most commonly used, one of my other favorites is a dash of cardamom along with the cinnamon. So, try it if you like the flavor of cardamom. 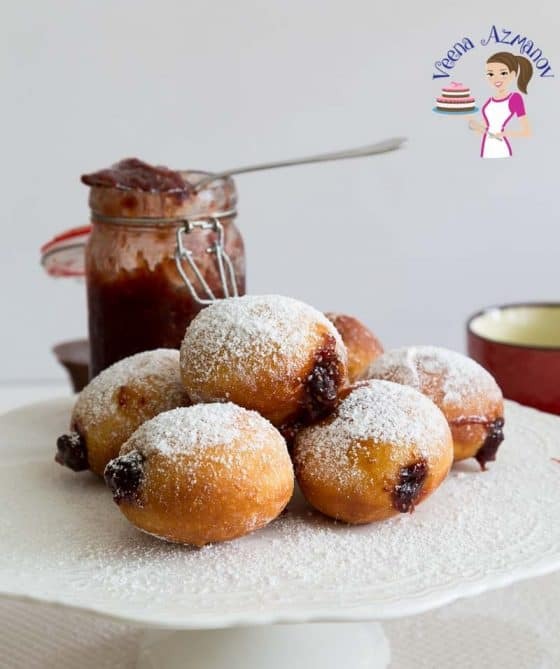 I prefer to make a small batch of doughnuts in a Mixing bowl but you can certainly use a stand mixer to make things easy on you. 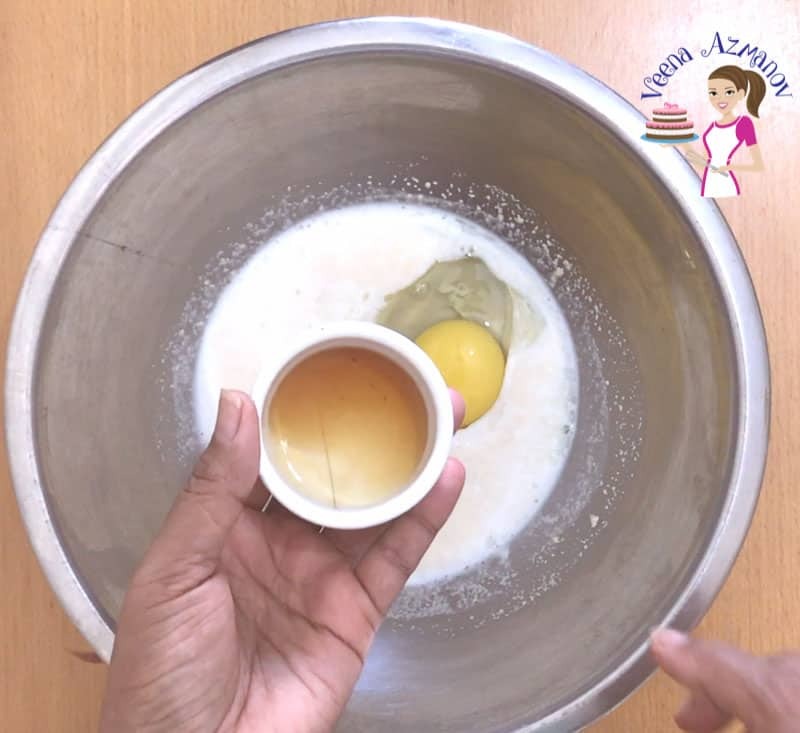 A Whisk helps to mix things up easily like flour and salt as well as the yeast and water. I also prefer a good silicon Spatula so I can bring things together in the center. An Rolling pin works for this recipe. I fry my doughnut in a Skillet with oil. And yet, you can certainly use a Deep Fryer if you have one. In a bowl combine warm milk, sugar and instant dry yeast. Let rest for 3 to 5 minutes until foamy. Combine flour, salt, pumpkin spice, and grated nutmeg. 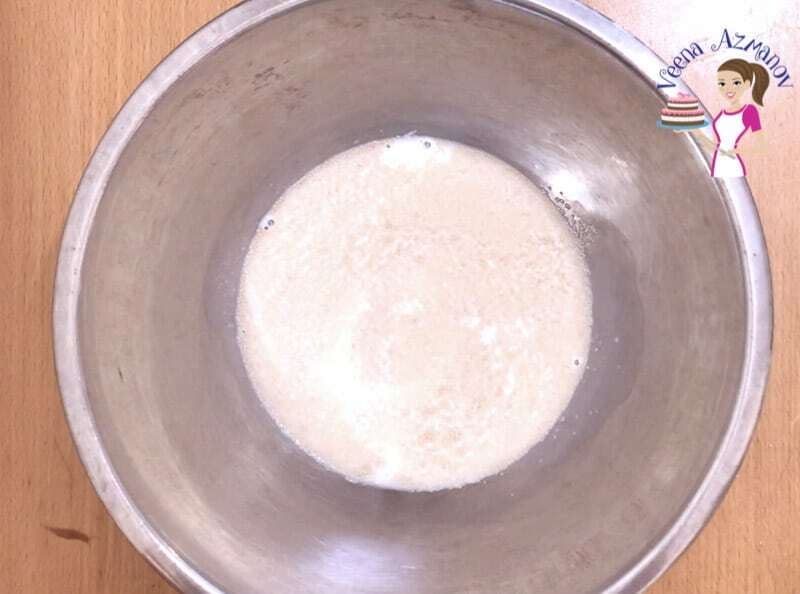 Add the wet ingredients into the dry ingredients – Yeast mixture to flour mixture. Combine well. 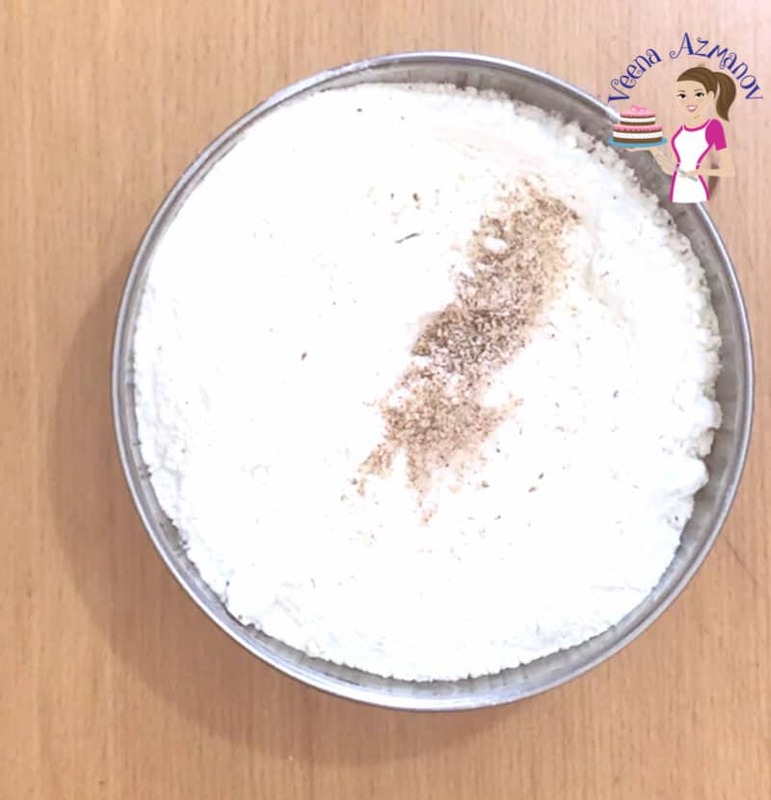 When all the dry flour is incorporated – use the extra flour for kneading. Transfer to a well-dusted work surface and knead for 5 minutes. The dough should be soft and elastic. Slightly sticky too. (as shown in the video). 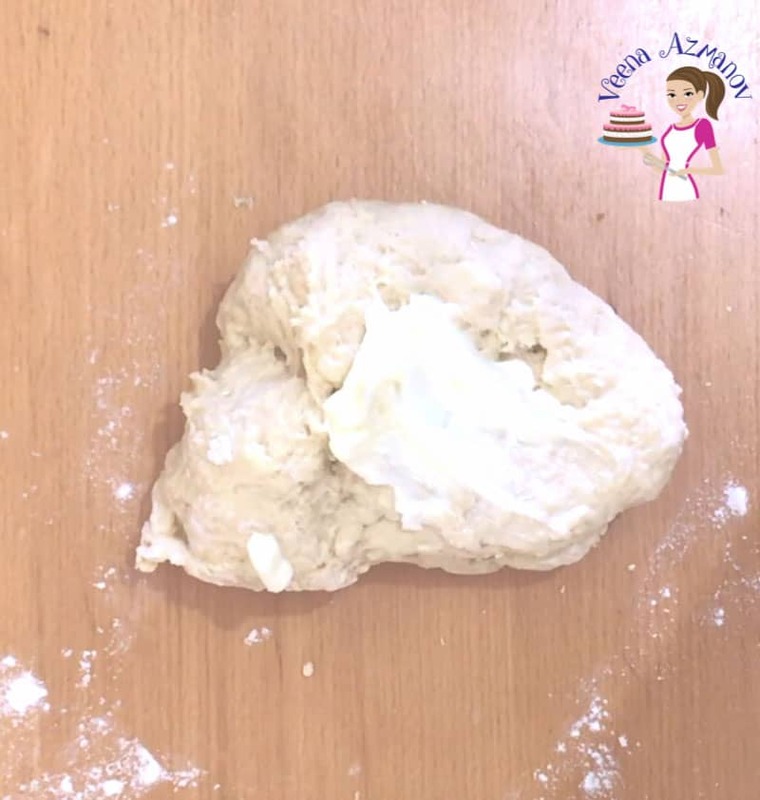 Tip – Check for consistency of dough when making yeast dough not the amount of flour. 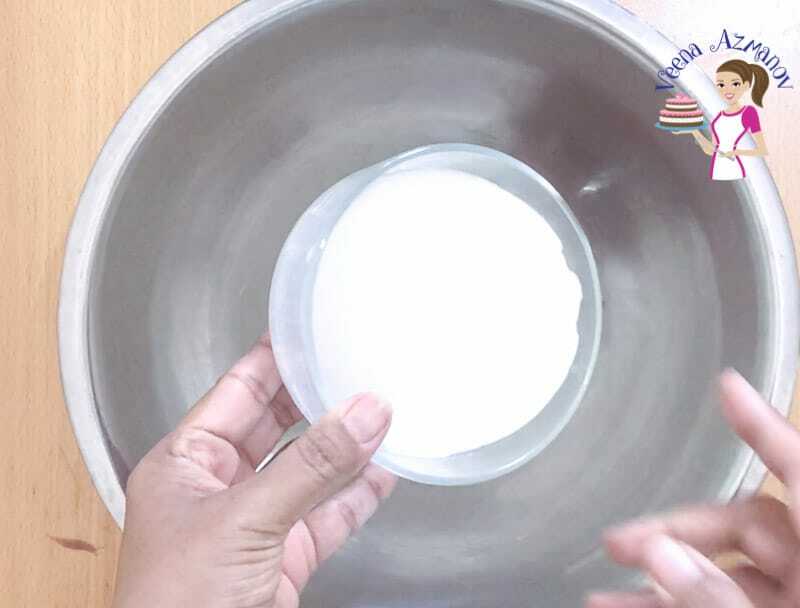 The dough needs to be soft and elastic not sticky. Whether you use milk or water make sure it is warm, about 110 F, not too hot nor too cold. This is the optimum temperature to activate the yeast. 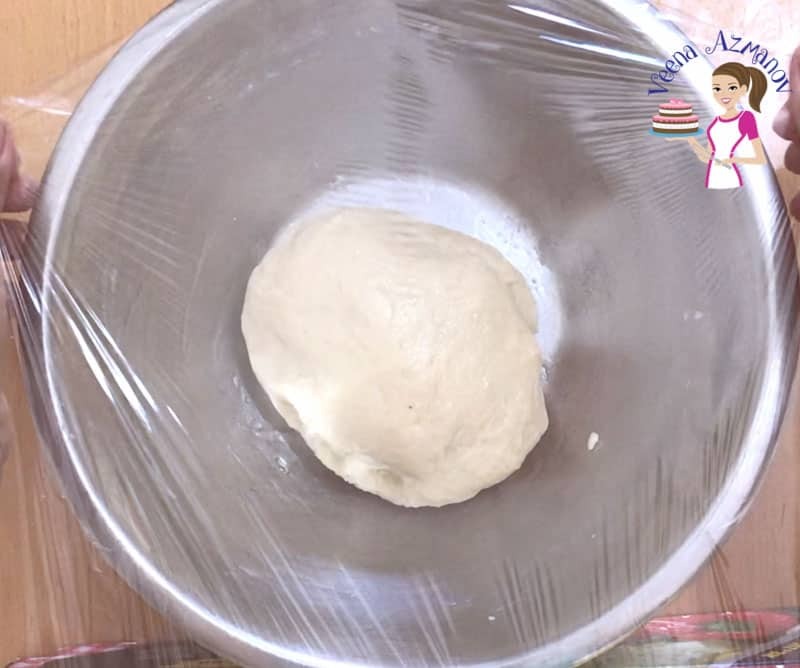 Place dough in an oiled bowl. Set in a warm place to prove for an hour or until double in volume. After an hour the dough should have been doubled in volume. Transfer to a well-dusted work surface. Gather into a ball and roll with a rolling pin dusted with flour as needed. Roll to about 1/4 inch thickness. Cut disc using a 3-inch cookie cutter. Use a 1/2 inch cookie cutter for the center hold. 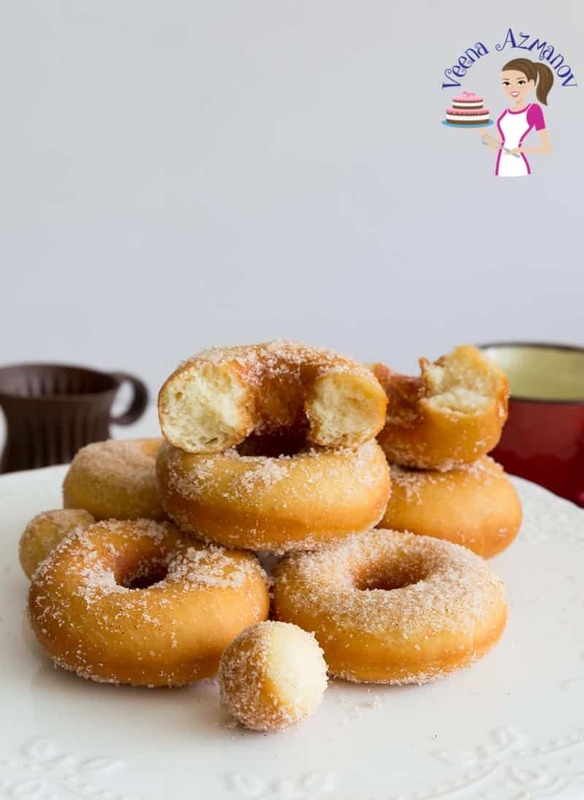 Transfer the donuts to a baking tray that has been lined with parchment paper and dusted with flour. 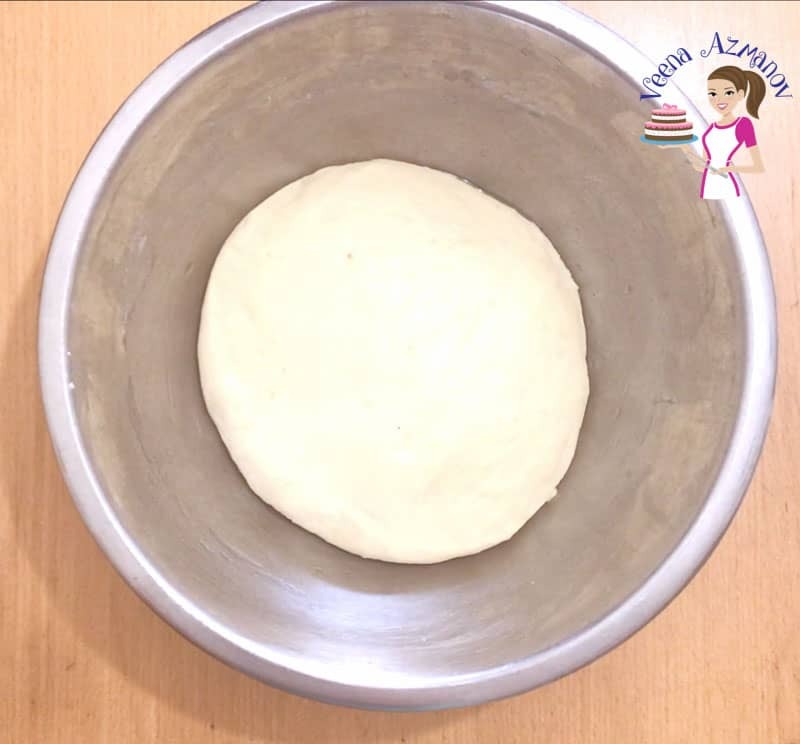 Gather the remaining dough, roll again using as little flour as possible until all the dough is used up. 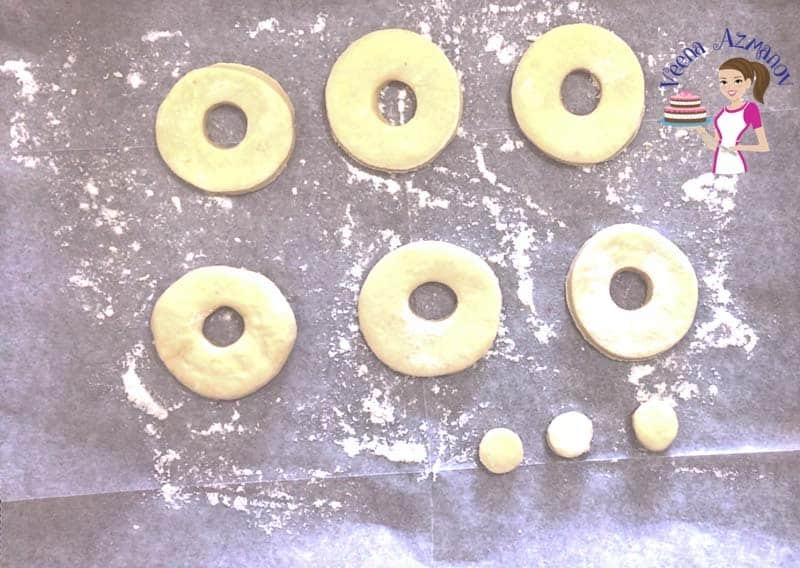 Cover the baking tray with a clean kitchen cloth to prevent the donuts from drying. Place the donuts in the fridge for about 45 minutes to an hour to prove again. They will rise and be cold but more comfortable to handle when chilled. 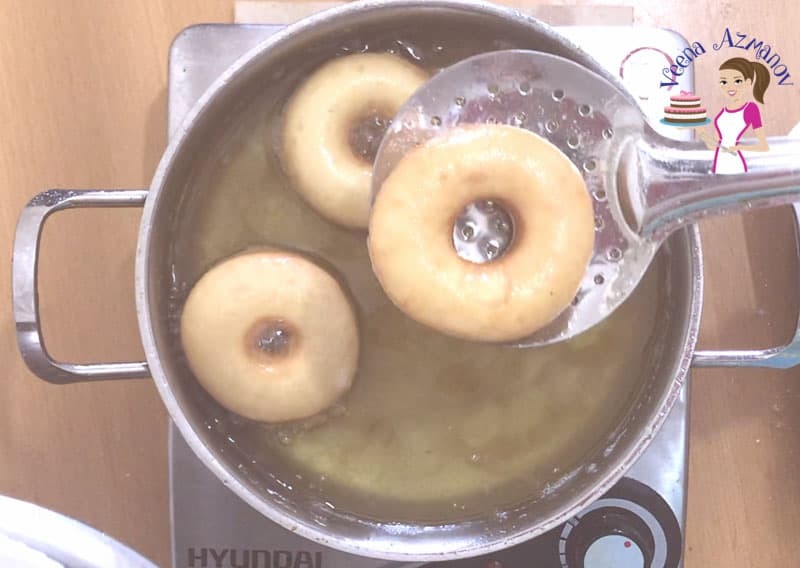 Pour oil in a skillet or deep fryer, make sure you have enough oil so the donuts will be at least half immersed in oil when puffed. If it bounces up before 30 seconds reduce heat slightly. 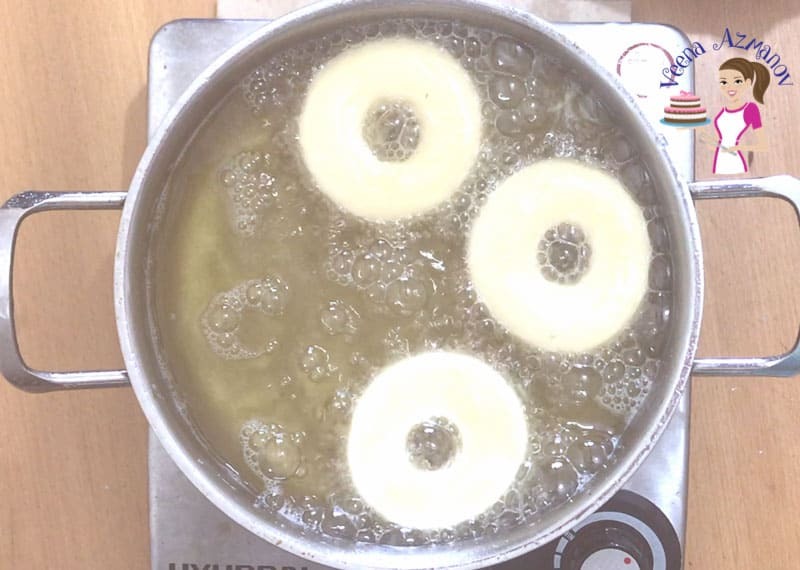 Gently add the cold donuts to the oil – you can add two to three depending on the size of your skillet. Let the donut cook 30 seconds then flip, so it puffs the other side too. Continue to cook gently turning as necessary until golden brown. Remove and drain on a paper hand towel for a minute. Combine the cinnamon and sugar in a small tray or bowl. Drop the hot donut into the cinnamon sugar while still warm, so it sticks to the donuts. If you wait too long, the cinnamon sugar won’t hold. You can brush cold doughnuts with melted butter then dust with cinnamon sugar. Share a picture of your work with me by uploading an image here below my Image on this board. To the prepared yeast mixture add the egg, and vanilla. Add the wet ingredients into the dry ingredients - Yeast mixture to flour mixture. Combine well. When all the dry flour is incorporated - use the extra flour for kneading. They will rise and be cold but easier to handle when chilled. You want the oil hot but not too hot - (see notes above). 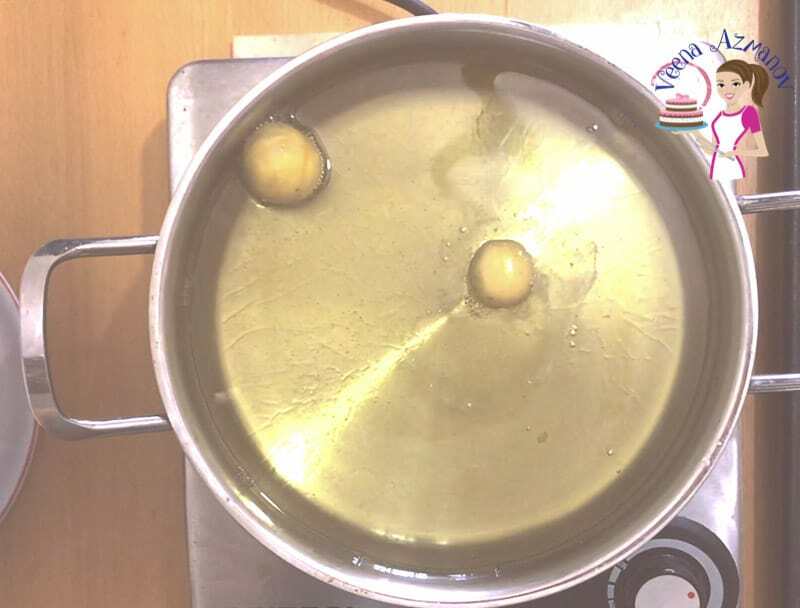 Gently add the cold donuts to the oil - you can add two to three depending on the size of your skillet. Let the donut cook 30 seconds, then flip, so it puffs the other side. Drop the hot donut into the cinnamon sugar, so it sticks to the donuts. If you wait too long, the cinnamon sugar won't stick. You can brush cold donuts with melted butter then dust with cinnamon sugar. 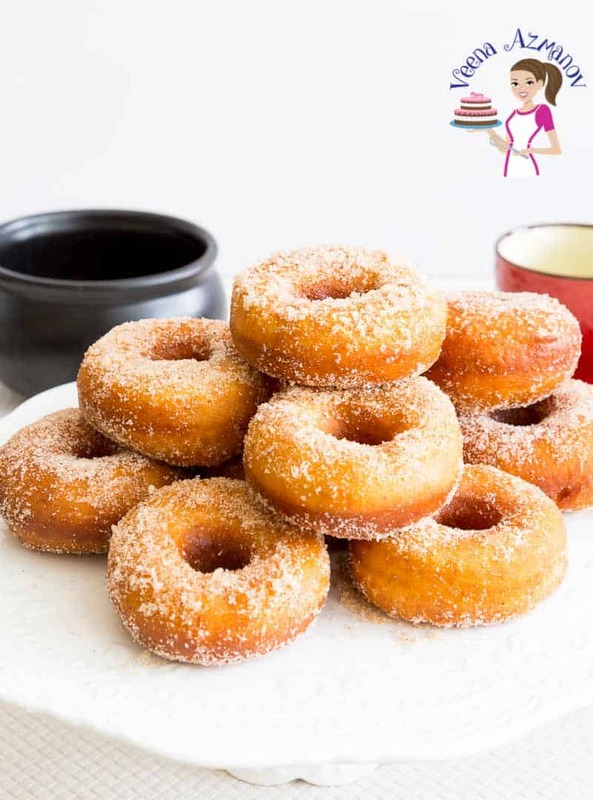 I wanted to know, if I have to make eggless donuts, what could I do to replace eggs from your recipe’s?? I love making donuts! I make more baked donuts than fried ones, so I need to get better making fried ones. I didn’t realize your can have dough rise in the fridge. Thanks for the tip! Those look absolutely perfect! I was craving a donut last week really bad. I don’t generally eat them because they don’t agree with me so therefore I crave them more! I’m going to have to try these someday just to say I’ve tried making donuts. You offer so many tips and information so I will come back here when I do it. I love your tutorials! Me too. Love Denise.I know that feeling – the forbidden fruit. These look like donuts my baba would make when I was a kid. I so remember running to her house after school and eating these. Love food memories. 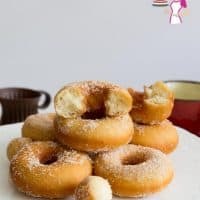 I’ve never made a yeast donut but your recipe and instructions look very simple to follow. Thanks! I believe I like fried donuts to cake donuts. I like the tip that you share — keep them sticky. I swear you must be the donut queen. I don’t think I’ve ever seen so many great donut recipes in one place. Hubby just got a big container of fresh oil for frying — I’ll have to make this recipe. Thank you, Marisa. My husband calls me the doughnut queen cause I make so many flavors and make them so often. I have never met a doughnut I didn’t like. Such a fun way to start the day. Me too. I love all kinds of doughnuts. These donuts look amazing. Can I make them in my air fryer? Not sure. I have not tried it yet. Donuts are my love language! My whole family LOVES donuts, especially cinnamon sugar ones. These look so tasty! OMG! 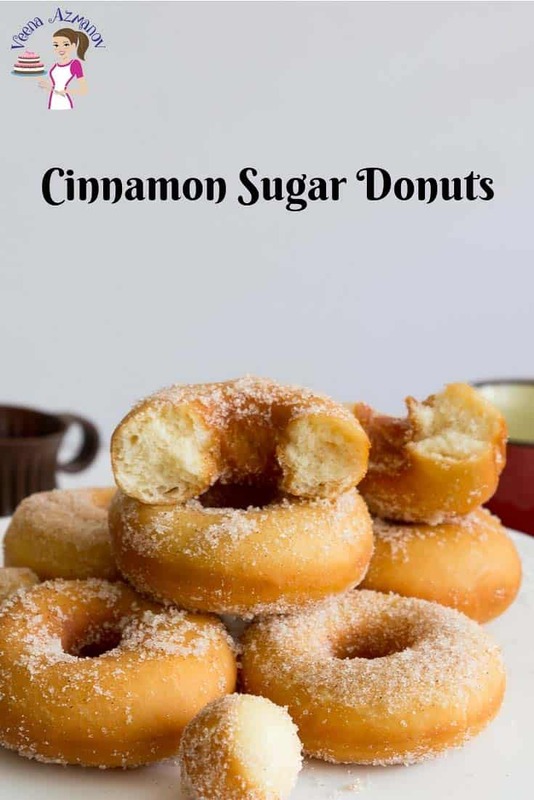 These look amazing, I make doughnuts once every few years because I have no self control when it comes to the deep fried goodness especially when you add cinnamon sugar!? I hear you, Chantal. I avoid but the kids need their treats. 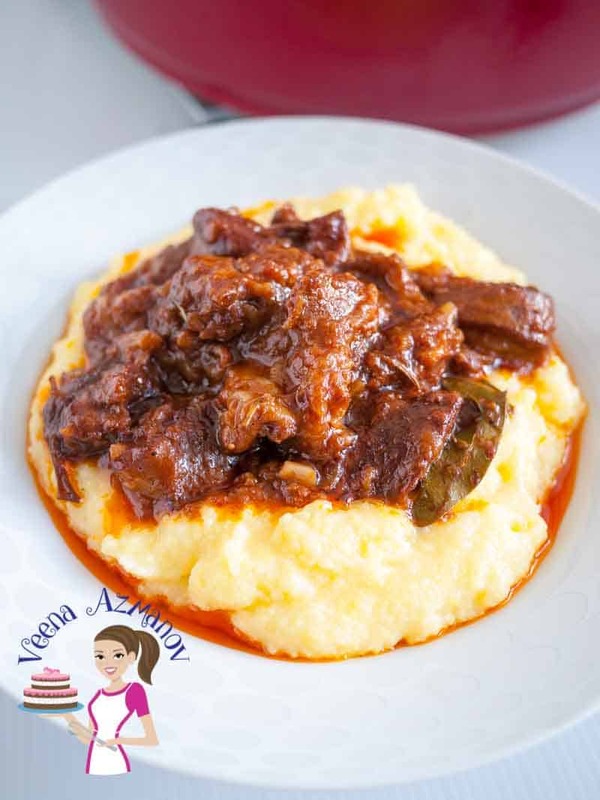 This recipe looks so delicious, and I love the step by step photos! Though I enjoy baked doughnuts, I think I prefer the fried ones. Cinnamon sugar is my favorite topping too. Thank you, Chichi. Yes, me too. Love fried donuts. donuts are my weakness. these sound incredible, i really want to try making donuts at home some time. great tip of chilling them before frying! Thank you, Danielle. These are so easy to make. These look absolutely delicious! Cinnamon is one of my favourite flavours so these would definitely go down a treat in my house! Thank you, Bintu. I love cinnamon too. 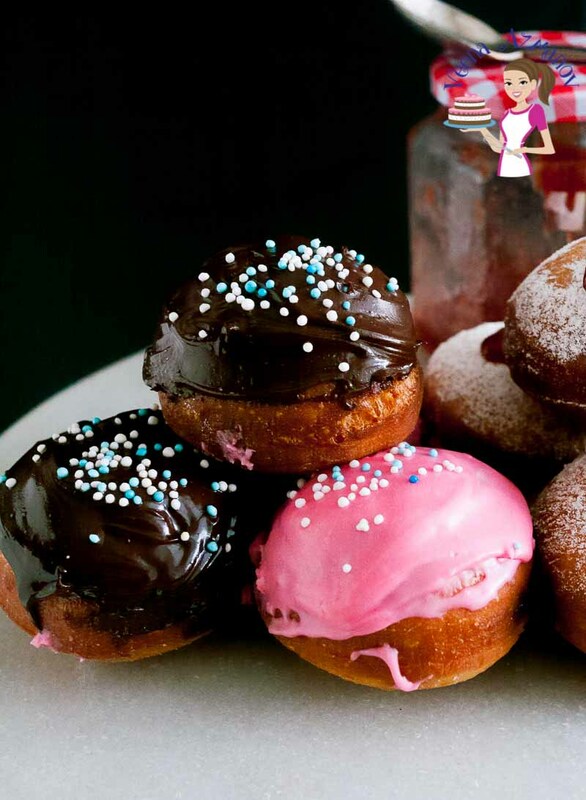 These donuts look so good, the fried version will be tastier, yummy share. Can you believe I’ve never had a donut in my entire life? I love how complex this post is, with step-by-step instructions. It’s really difficult to screw things up.